Who else is happy it’s the weekend? This girl definitely is and she’s even starting it a day early! (smile) This weekend I’m off on a mini-adventure to the north in search of changing leaves and (even) cooler weather. I really find myself appreciating the small things like sweaters and hot beverages since moving to Phoenix. I think I’ll be looking for more seasons in my next long-term destination. While I’m off searching for awesome photos this weekend, I thought I would share some of the photos I took last weekend. 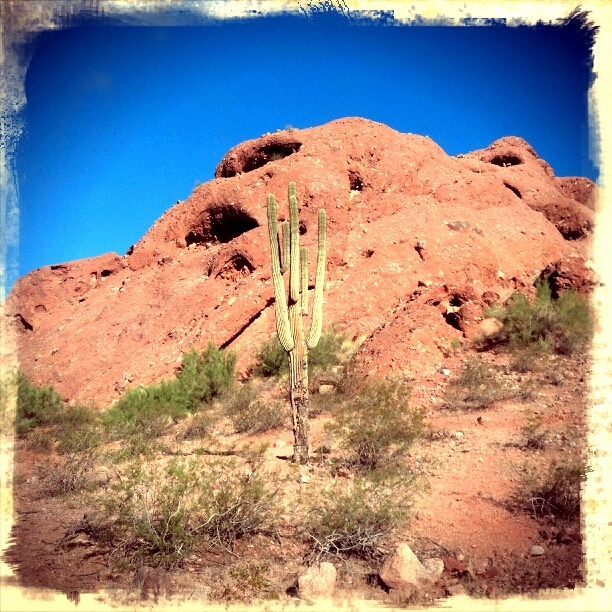 These were taken at Papago Park in Phoenix. Papago Park is made up of very distinctive sandstone formations that almost make you feel like you’re on another planet. It has a number of trails for those on foot or bike, those looking for an easy stroll or a bit of a climb. I’ve actually seen groups rappelling from some of these peaks, which seems both scary and awesome all at the same time (smile). This is just one of many rocks you can climb, etc. The park has a pretty interesting past. It was designated as a National Monument in the 1930s but the status was later rescinded. The park later served as a POW camp during World War II; it was also the site of the largest mass escape from any US prison camp. After escaping the prisoners quickly realized they knew nothing about surviving in the desert and either returned to camp or were caught after a rather brief search. Even though the city has grown up around the park quite a bit by now, I can still see where the Arizona terrain would be a bit daunting. But it sure is beautiful (in it’s own way)!